I’ve started using checklists. A few nights ago I made a small, careless mistake and wrecked one of my nice 60 degree milling bits (at $14 a pop). Leaving the probe wiring connected so I get a probe error as soon as the tool touches the workpiece. So, in the interest of saving time, money, parts and frustration, I finally created a basic checklist. I keep thinking “this is easy, I’m pretty good at it”. Followed by the sound of a axis reaching it’s torque limit. 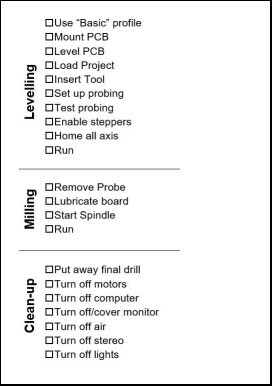 I set up the checklist in three parts: Setup, milling, cleanup. This particular example is for isolation-routing PC boards. I put the page in a plastic sleeve so I can use a whiteboard marker and erase it when I’m done. So far, so good. Now I need a checklist to remind me that I’m not smarter than the checklist.